This is a great smartboard to have on hand for introducing new letters to little learners. Each slide shows the correct formation of the letter and allows for the student to practice forming it themselves. You can separate each letter out into its own file or keep them stored together. In my class, we use them whole group to introduce new letters but students also use them during small group and individual practice time (Daily 5 etc.) to give them further opportunities to work on handwriting. In addition to the 4 colored markers that come with your smartboard, consider teaching your students how to select the marker button in the toolbox at the top of your screen (it is the one directly below the black arrow) to select additional marker/crayon/pen options and colors. My students loves the "creative pens" the most. 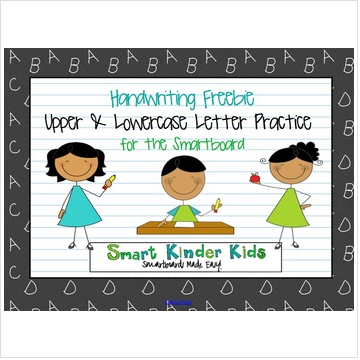 This freebie is also great because it gives your little ones a chance to practice writing on the smartboard. Kids usually find it difficult at first because if their hand is on the board at all the marker will not write correctly, so having a large letter to trace helps them learn the skill of writing properly on the board. where there are products, links and even some free tutorials for those wanting to learn how to design their own Smartboard files!